Can You See What I Love About This? It’s the fine print underneath: “Fantasy. Simulated Image. Do not attempt. Cars can’t snowboard.” This is from a Nissan commercial I’ve been seeing during hockey games (you’re welcome for the free marketing analytics there, Nissan). Can you imagine the board meeting where they had to decide exactly what to write at the bottom of the TV screen? #1 Executive: And of course we’ll get the computer guys to write a disclaimer under that part where the cars start jumping like snowboarders. #2 Executive: I’m thinking we could get away easy with this one, since it’s so obvious. Just write “Simulated Image.” Which will be obvious, but, you know, formality. #1 Executive: We ah, yeah, probably are gonna need more than that. If we’re not straightforward about this, some idiot’s gonna sue us when his car slams into a snowbank that he thought he could use as a ramp. #2 Executive: True, true, can’t be too careful with the general public. How about we add “Fantasy” before it? #3 Executive: I like that idea, I think you’re not quite being… frank enough. More bluntness. Blunts are the only things these people understand. #1 Executive: Forgive me for being cliche, but I think the old “Do not attempt” has a place here. #3 Executive: Cars can’t snowboard. 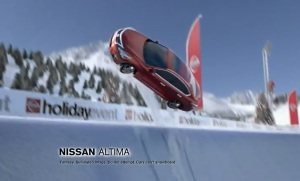 #3 Executive: No, I mean we should write “Cars can’t snowboard” on the screen. I mean I think we have to. They had to write that. You know they wrote it because they had to. Their general opinion of the demographic to which they choose to advertise is so stupid that they will buy products and then try to take a car down a halfpipe. The crazy thing? I don’t know if I disagree.